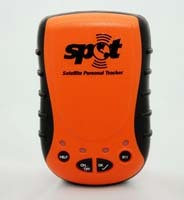 SPOT is the world’s first satellite messenger. SPOT sends your exact GPS coordinates and selected messages over commercial satellites to tell others of your location and status.  SPOT is the world’s first satellite messenger. SPOT sends your exact GPS coordinates and selected messages over commercial satellites to tell others of your location and status.  SPOT works around the world, independently of cellular networks.  SPOT uses the GPS satellite system to determine a user’s location and the SPOT satellite network to transmit that location and the user’s status.  The SPOT satellite network is a commercial satellite network with a proven 99.4% reliability rate while processing over 6 million messages a month – the equivalent of 2.3 messages per second.  Satellite coverage works around the world, independently of cellular systems, with outstanding reliability.  More affordable and more functional than Personal Locator Beacons (PLB), cellular-based GPS trackers, and comparable handheld devices. o Service Fee: $99 USD annual OR $9.99 USD monthly subscription charge. Optional features including automatic tracking service (SPOTcasting) and guaranteed extraction service for countries or regions with non-responsive emergency services. SPOT works around the world, including virtually all of North America, Europe and Australia, portions of South America, Northern Africa and Northeastern Asia, and hundreds or thousands of miles offshore of these areas. o Dropped twice on all six sides from one meter onto hard surface. OSHA certified Intrinsically Safe to Class 1, Division 1, Group A-D standards. Certified to FCC and CE emissions, immunity and safety regulations. Meets FCC part 25 regulations, Canada type approval, CISPR Publication 22 (1985 1st Edition), RTTE Directive (1999/EC), IEC 60950 safety standard, and European EMC Directive 89/336/EEC. location and message to the SPOT satellite system. emergency notification via the response center. your location using Google Maps. the dark. To turn SPOT off, press and hold the ON/OFF button for 3 seconds. chosen to receive your messages. Use this option in the event of a life threatening or other critical emergency. activate the 9-1-1 function, the Emergency Response Center will treat it as a real emergency.